Rabash’s articles start gradually becoming clear to a person to the degree he actualizes them. At first it seems like they are written gracelessly and incorrectly, that their separate parts are unconnected, and they lack order. In these articles we do not see the precise movement of the forces of the soul which develops precisely this way, and that’s because we do not know our soul. If a person carries out his actions on his own and at the same time studies these articles, then he sees that they are written absolutely precisely and could not be written otherwise. That is because Kabbalists wrote their texts based on what they felt, and all of the souls go through the same path and the same states. Therefore, these articles become closer and clearer to a person with time; they are the “manuscript” of his soul. At first a person who studies tries to memorize the material. He remembers separate phrases, understands some of them, while some of them still remain unclear. He repeats them like a child repeating the words of adults without understanding their meaning. Gradually, to the degree he realizes these articles, he begins to see that these lines express his states with absolute accuracy and it is impossible to write them differently. That is exactly why Kabbalists use quotes from the Psalms, Talmud, Prophets, and other sources. These articles are absolutely special. I grew up with them; they were written by my side. Later on, as I read them over the course of many years, I saw that they become closer and more real for a person so that eventually you no longer read them in a book, but from inside, from your soul, which becomes revealed to you together with these words. This will happen to everyone precisely for the reason that these articles were written based on the full attainment of the soul. Rabash was great no matter how much he concealed himself. Yet he did succeed in concealing himself from everyone! However, a person who attains Rabash’s articles sees that this was a great person. In the entire lineage of Kabbalists preceding him, starting from Adam, there was no one who laid out the system of spiritual work so sequentially and in such detail while keeping the connection with the root, using the language of branches, and with the entire Pentateuch (Tanach). Moreover, he explained the system of spiritual work openly, making it accessible to all. Rabash takes you by the hand and leads you through all the phases of the articles in such a way that you cannot make a mistake. He underlines every detail that you should pay attention to. In fact, we don’t have a teacher who’s closer for developing the soul. Baal HaSulam is very high, academic, and universal. He comes down to us from a high mountain, while Rabash is a close and tender mentor who gently gives us the method of correction with love and care. Question: Is there a difference between a student studying Kabbalah one on one with a Kabbalist teacher and the way we study in a group? Answer: You also study together with me at the lesson. Of course, it’s different from having a one on one lesson, but I don’t think that today it is possible to pass this science on to anyone individually. In our time this is possible only by studying in a group or through the Internet in the widest possible form, and it makes no difference where a student is. The student will advance, whereas the previous individual method no longer works. You shouldn’t regret the impossible, but should use everything you have. Every person has a governance from above and the Creator controls the entire process. Any place where you have freedom of choice, you should realize it and that’s all. I don’t have any students that are closer to or farther from me. The student himself continuously determines how close he is, and that is how much he advances. Whether a student is close to me or far is determined only by how much he desires to accept my inner message, absorb it, and realize it. This does not depend on whether a person is located right here in the classroom or lives far away and studies over the Internet, or whether it’s a man or a woman. Everything depends on the student and how he uses the means that are given to everyone. Besides, it’s very important to not forget that it is impossible for the student to respect the teacher while neglecting the group. That’s because a teacher is the innermost part of the group, the message that is inside it. Therefore, it’s impossible for a person to scorn the group while respecting the teacher, the group’s inner charge. The group is our mutual place with the teacher, the place where we meet. This did not exist in previous times, when the student worked with his teacher face to face. When we meet inside of the group, every student determines for himself whether he unites with the teacher “Peh el Peh” (through a common screen) or “Peh el Awzen” (from the mouth into the ear, like when studying regular science). At the end of it all, we meet the Creator, because everything is united until the world of Infinity. Question: Suppose that we have already reached the state where all seven billion people in the world study and actualize Kabbalah. Now a child is born into this world. What happens to him? Will he have to understand the meaning of evil in order to reach good? But by that time the world will already be corrected, so how will he feel evil? Answer: In this world there is only a renewal of physical bodies, but not souls. Therefore, the children being born today are old souls that acquire new bodies. That’s why we don’t pay attention to a person’s age. Regardless of whether a physical body has died or has been born to live in this world, the soul continues its reincarnations. You’re asking: If all the people correct their egos, will it be necessary for more people to be born? No, the souls will no longer need to be born. However, we won’t live forever biologically. We will begin to feel how our world changes, gradually acquiring the qualities of the upper world. To the degree each of us and all of us together are corrected in the single system, our perception of the world changes as well. When we ascend from the first level of the spiritual world to the second and then the third, we go from one world to the next. And when we attain the state of full correction in the common interconnection, our world will be destroyed. It is written, “Six thousand years of concealment and one year of destruction.” It will be the seventh millennium. “The world will be destroyed” means that this world will disappear from our sensation because we perceive it in our common egoism. As soon as our egoism turns to bestowal and love, then instead of it we will feel the upper world. In Moses’ standoff with Pharaoh we reveal the unique nature of our spiritual work. We work with our egoism, the will to receive; we don’t cancel it out, but rather cultivate and develop it. It is written: “I created the evil inclination, and I created the Torah as a spice for it.” The Torah is only a spice for the egoistic desire: a little pepper, a dab of salt for all of this big meal called egoism, the will to receive pleasure. Indeed, what do we lack? We only have to add some Torah to turn the entire enormous egoism into the world of Infinity. The form of authentic spiritual work is turning the staff into a snake and the snake into a staff. It all depends on how a person employs all of his attributes and predispositions. He destroys neither the good nor the evil ones and renounces none of his capacities! He must only modify the way he is using them. If a person throws the staff on the group, it turns into a snake; and if he grabs the snake by the tail, it turns into a staff which helps him to move forth. The staff (Maté) derives from the Hebrew word “below” (Máta), meaning that a person reduces himself and with the help of the force regarded as “faith above reason,” elevates his egoism, the property of Malchut, to the property of Bina. Each time, in the ten impure Sefirot, the ten manifestations of Pharaoh, he experiences an increasingly greater egoism that he can reform by way of ten Egyptian plagues. A person who is in the state of exodus from Egypt is willing to go through all of the 10 plagues. By using the staff, He himself causes the blows that strike him and help him rise above egoism. He views these blows as medicine. Similarly, we are willing to take any painful and unpleasant treatment in order to get well again. Each of us should make sure his time is being used in the most efficient manner. I don’t see how one can succeed in anything without an individual work plan. It is essential to design such a plan for each upcoming week, in order to know what to do. I need to establish it for myself and not back out from what I have planned. Besides, it has to be tied to all other work plans so that I stay connected with them like a cogwheel in the entire system. Therefore, each hour and every minute have to be written out precisely. And inasmuch as a person worries about the external environment, to make sure that his work brings fruit to the others, he succeeds in the internal work as well. In order to build spiritual degrees, I need to add the matter of desire time after time. The height of every new degree corresponds to the heaviness of my current state in which the evil of egoism is revealed. This happens in all the states on the spiritual path. In order to elevate me, I am given additional ego, and then I feel the evil. Afterwards, with the help of the environment, I recognize the evil and gradually cognize the fact that it does not occur incidentally. Then I try to relate it to the goal: It comes from the Creator who is good, and it is meant for my own benefit. 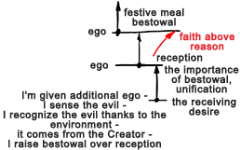 Later, I begin to connect my state to bestowal, meaning that I elevate bestowal above reception. Then gradually I build a vector, an attitude, from this evil. I raise the importance of bestowal and unification over the receiving desire. Thus, having formed this attitude, I rise to the next degree. I stay on the new degree for a mere second, after which everything disappears. If during this second I do not find the next receiving desire in me, I will immediately descend. The crudest but must accurate example is sexual pleasure. As soon as it ends, I become completely empty, and I need to begin something new. Therefore, when I rise to a degree of love and bestowal that I desire so greatly, I instantly need to reveal a new egoistic desire. It must be revealed in order for me to rise to the next degree This desire is already instilled in me in the form of Reshimot (informational records), and I only need to work with them. Otherwise, they will be revealed after a long period of time, after a few months, for example. However, I seek for them now, in darkness. After all, the absence of changes is "night" for me. Even the best possible state turns to night if it is not renewed. Therefore, we constantly need to be ahead of events: Instead of just maintaining the speed, we need to accelerate it. Thus I search for my new, even greater egoistic desire. I don’t "invent" it; I search for it. And when I find it, I repeat the same stages of work. In this manner, I work on the "bride," until I correct it completely and go on to the "groom’s festive meal." 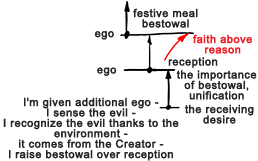 The method is simple: I raise bestowal above reception by working in faith above reason. Every new degree "ruins" the previous one, turning faith into egoism, and I begin the ascent again. Meanwhile, it seems to me that I have lost everything that I achieved, but actually I correct a new portion of egoism according to the principle of passing degrees: "Keter of the lower one becomes Malchut of the upper one." Question: Rabash writes that a person “should have faith.” What does this mean? Answer: First of all, there is a notion of “faith in the sages.” This refers to the Kabbalists who completed the journey and left us the method. They explain the method in a very logical manner and to the point, but for now we still have to believe their words. Granted, we do have a point in the heart, and we agree with them. Nevertheless, there is a place for faith here: I entrust myself to the insight of the upper one who has already acquired the experience. Even a real, practical analysis does not eliminate a “spot of weakness,” something not very obvious, and I simply follow the upper one. I literally grab his hand and walk by his side. Baal HaSulam explains that one needs to find a teacher and “cling” to him in order to try to know him from the inside from the actions that he recommends. This faith is essential. This is how a child believes an adult. Moreover, you only accept on faith the actions that he recommends, and you see that he is right thanks to this small and quick step. It is not blind faith: You continuously lower your head in order to use his, to rise slightly and immediately confirm that he is right. In reality, it is not as much faith but study, an exercise, which can be immediately verified. Overall, in Kabbalah, the notion of “faith” stands for the force of bestowal, whereas “knowledge” is the force of reception. We advance through these two forces. What Do I Want To Reveal? Question: What clarifications do I need to perform in order to advance spiritually? Answer: Clarifications that we perform on our spiritual path come down to a single question: What exactly do I wish to reveal? All these clarifications occur when we listen to or study the material that describes the spiritual reality to us. Thus, when I open the book in order to reveal the form, the picture of the spiritual reality and see myself in it, I perform the clarification by examining the following: Who am I relative to what becomes revealed to me? What is the essence of that development, which is attained through Torah [correction by the way of Light, as it is said: “I created the evil inclination, and I gave the Torah for its correction so that its Light will return us to good”] and Mitzvot [man’s egoism consists of 613 egoistic desires which have to be corrected into the opposite ones, which is called performing 613 commandments]? Bear in mind that it is the recognition of the evil within us. That engagement in Mitzvot can slowly and gradually refine those who delve in them. And the scale by which we measure the degrees of refinement is the measurement of the recognition of the evil within us. Through the subtle pleasantness we feel when working sincerely to Him, to please Him, there develops within us a relative recognition of the lowliness of these sparks of self-love—that they are obstacles on our way to receiving that subtle taste of bestowal upon the Creator.